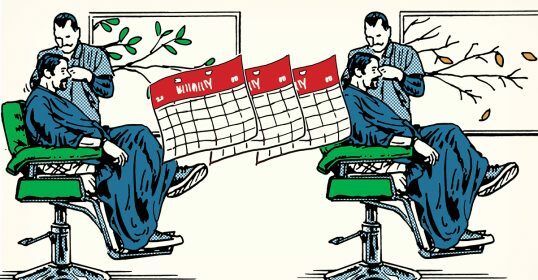 So you’ve decided to upgrade your hairstyle from your boyish, middle school spiky in the front get-up to a manly Mad Men haircut with a nice taper and a sharp, crisp part. Bully for you! 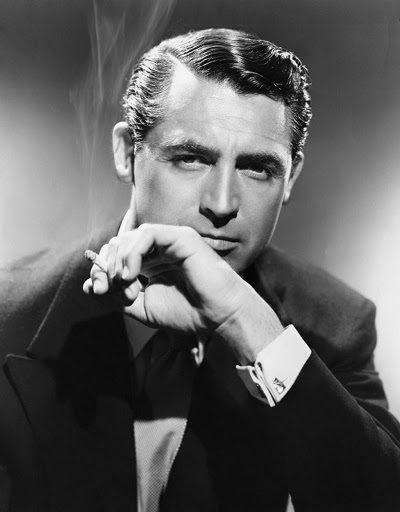 But to get that handsome, Cary Grant shine, you’ll need to man-up your hair products from the sticky blue hair gel you’ve been using since you were first sprouting armpit hair. Below I’ve compiled a list of five old-school hair products that are guaranteed to give you that shiny, silver-screen leading man look. Chances are your grandpa used (and maybe still uses) these same products. Not only did Gramps know a thing or two about shaving, he also knew how to get a smooth do to match his smooth swagger. 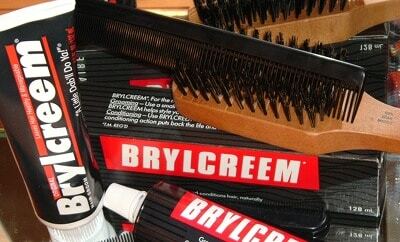 For nearly 90 years, Brylcreem has been a staple in men’s medicine cabinets. Its mineral oil/beeswax base provides maximum sheen and all-day hold, while keeping your hair soft and pliable. Plus, it leaves your hair smelling delightfully clean and manly. This is my favorite old-school groom and the one Kate says looks best in my hair. According to the makers of Brylcreem, just “a little dab will do ya” to get maximum shine and hold. In my experience, I’ve had to use more than just a little dab. It might be because I have pretty thick hair. So you’ll have to experiment to find the amount that works for you. To use Brylcreem, simply rub a little (or large) dab into your hair while its still damp. Style as desired. A big tube of Brylcreem will set you back about $7, but it will last you a fairly long time. When I was using Brylcreem regularly, a tube lasted me about 6 months. Pretty good value, if you ask me. 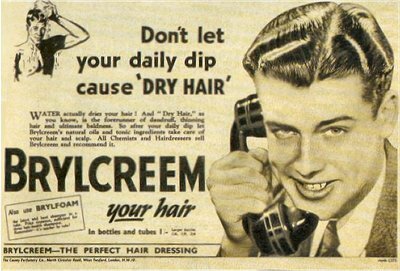 On the downside, Brylcreem (and many of these old-school hair products) can leave your hair feeling greasy on account of its oil base. If you do use Brylcreem, wash your hair every day or else you’ll get a super thick build up of grease in your hair. I found that it would take two or three hair washes to completely rid my hair of it. The extra oil in Brylcreem can also cause acne flare-ups around your hairline. I’ve had this problem with Brylcreem in the hot and humid Oklahoma summers. I end up sweating Brylcreem out of my hair and onto my face, and I start looking like a pimply 16-year old. Consequently, I just use Brylcreem during the winter months. 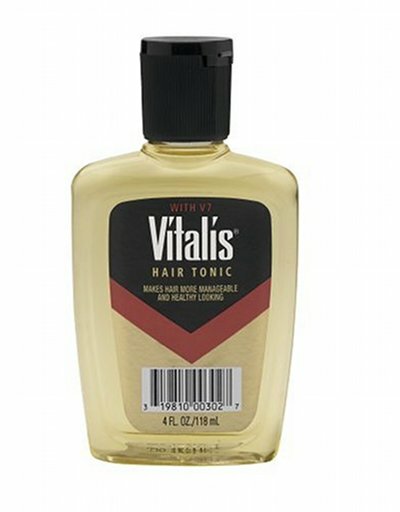 Touted as a greaseless alternative to pomades and other grooming products, Vitalis Hair Tonic was the go-to hair product for up-scale gents who wanted shiny hair without looking like some greasy punk kid. 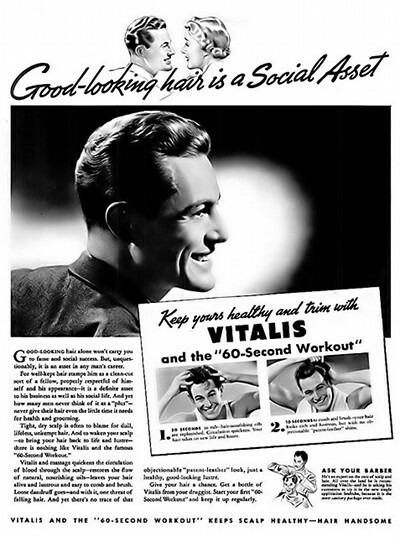 (Fast Fact: Vitalis and its users often referred to products like Brylcreem as “greasy kids’ stuff.”) Vitalis is able to provide the shine without the grease because of “the greaseless grooming discovery V7.” (I still haven’t been able to figure out what this magical V7 stuff is exactly). While Vitalis provides a handsome sheen to your hair and makes it easier to comb and style, it doesn’t provide much hold. You’ll have to keep applying it throughout the day to keep your hair looking wet. At least that’s been my experience. The high alcohol content leaves your hair with a pleasant antiseptic smell to it. You’d think smelling like rubbing alcohol would be a bad thing, but somehow Vitalis makes it work. Just make sure you keep your head away from any open flames as the alcohol is a fire hazard. 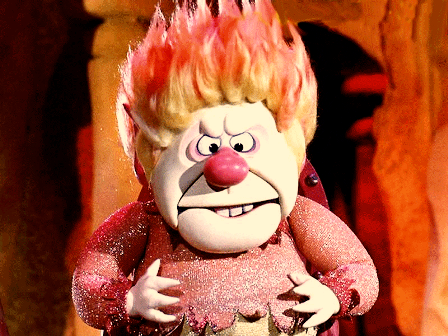 Fire-hair only works for the Heat Miser. A bottle of Vitalis will set you back about $5. To use, simply pour a small amount of the golden liquid into your hand and massage into your scalp and hair for 60 seconds. Comb. Bada-bing! You’re looking like Sinatra before his toupee days. Groom and Clean is my second favorite of all the old-school men’s hair products. It’s water based so it doesn’t leave your hair feeling greasy, yet it still gives you that slick, vintage Hollywood look. Groom and Clean provides excellent all day hold, so you’re looking dapper from morning until night. Because it’s water based, it washes out easily. You just have to rinse your hair with water and it’s gone. Much better than Brylcreem and other oil based hair grooms. Another benefit the Groom and Clean manufacturers tout is that it cleans away dirt and dandruff. I’m not sure if there’s any evidence to back up the cleaning properties of Groom and Clean, but based on my experience, I can say that my hair feels cleaner throughout the day when I use it. So that’s a bonus. It also has a very pleasant, spicy smell to it. I can’t quite put my finger on what it is. It’s sort of like zucchini or pumpkin bread. Whatever it is, I like it. Groom and Clean comes in a big tube and has the consistency of modern hair gels, without their usual stickiness. A tube will set you back about $5, and it lasts a long time. Since 1925, Murray’s Pomade has been providing shine and hold to the hair of men from all walks of life. Invented by C.D. 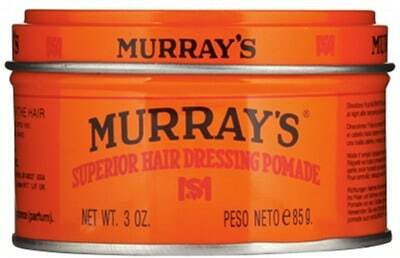 Murray, an African-American barber from Chicago, Murray’s Pomade was originally designed for and marketed to black men to achieve that classic wave look, but white dudes soon discovered that the orange tins of goop provided amazing hold, lift, and shine for their hair, too. It’s the perfect substance to mold massive pompadours. Murray’s Pomade is heavy and greasy. It has the thick consistency of Vaseline petroleum jelly. Because Murray’s is so thick, you’ll have to soften it up with heat before you can use it. People who use Murray’s all have different tricks for warming their pomade. Some just use the friction between their hands while others will scoop some out with their comb and run a hair dryer over it until it melts a bit, then they comb it into their hair. Murray’s was designed to stay in hair for a long time, so it’s a booger to wash out. (This is the complaint I had when I used the product.) The company’s website suggests using liquid dish washing soap to wash it out of your hair. Some customers claim rinsing your hair with Coca-Cola will do the trick. Like any oil based hair product, Murray’s can cause acne along the hairline. Wash your hair and face regularly to avoid outbreaks. A three ounce can of Murray’s Pomade will only set you back $3. You can pick-up a can in the African-American haircare section at most drugstores. Note: Murray’s has expanded their product line beyond their original pomade. Check out their Nu Nile Hair Slick Pomade for an especially wet look. Infused with lanolin, Wildroot Cream Oil keeps hair slick and oh so shiny throughout the day. Wildroot has a thinner consistency than the other hair products. It feels almost like sunscreen lotion. Consequently, it doesn’t feel as heavy on the head as a product like Brylcreem does. It has a subtle talc scent that blends well with other manly smells. A large bottle of Wildroot will set you back about $7. Again, like many of these products, it will last you a pretty long time, so it’s a good value. I’ve used Wildroot off and on for a few years, and it’s my least favorite of the old-school men’s hair products. My biggest complaint (despite what advertisements for the product claim) is how oily the stuff is. While it doesn’t feel as thick in your hair as Brylcreem, I feel like Wildroot doesn’t do a good job of staying on my head where it belongs. By the middle of the day, my face is all greasy, even if I haven’t been sweating. I tend to break out with acne more with Wildroot, too. My other complaint with Wildroot is that it doesn’t comb in as well as pomades or Brylcreem. I’m often left with white streaks in my hair. Granted, I could be doing something wrong, but I’ve never had this problem with any of the other products. 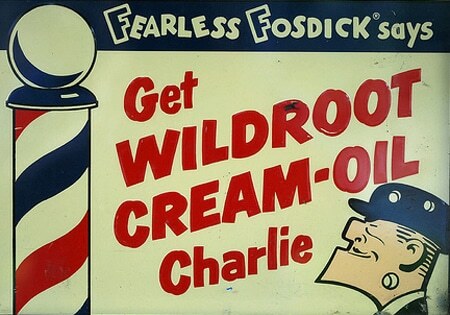 While Wildroot doesn’t work for me, it seems to work fantastically for Wildroot Charlie. Just a whistle, wink, and a bit of Wildroot and the girl is his. Let’s see your hair gel do that. You can buy all of these old-school hair products at most drug stores and big box retailers like Target and Wal-Mart. You’d think these items would be in the haircare section along with the gels and other modern hair styling products, but you’d be wrong. They’re typically shelved along with the men’s shaving stuff next to bottles of Electrashave and A Touch of Gray. I learned this when I bought Brylcreem for the first time and scoured the haircare section at Walgreens for half an hour. An elderly clerk finally pointed me to where the old-school hair products were and noted that it was kind of strange to see such a young man buying a big tube of Brylcreem. Also, I highly recommend checking out Pomade Shop. It’s a German-based website that’s dedicated to old-school men’s hair products. They have 107 different kinds of pomades in their online store including once popular brands like Royal Crown and Sweet Georgia Brown. Alright, so some of you might not be into the whole retro man stuff like me and other AoM readers. You might be asking, “Are there any modern products that can give that Cary Grant shine?” Why, yes. Yes there are. Axe Smooth and Sophisticated Look Shine Pomade. As much as I can’t stand Axe’s gag inducing adolescent smelling “double pits to chesty” body spray, they do make a pretty decent and affordable pomade. It holds hair well and gives a nice shine but washes out more easily than traditional pomades. Instead of the traditional musty smell of most pomades, Axe Smooth and Sophisticated Pomade has a sort of minty scent. A 2.64 ounce can costs $8. Not too shabby, but still not as good a value as the old-school stuff. Hawleywood’s Layrite Pomade. Developed by Hawleywood’s Barbershop and Shave Parlor in California, Layrite Pomade provides the sheen and hold of old-school pomades without the greasiness. It’s water based, so it washes out easily. A four ounce tube is a little pricey at $15, but it might be worth it if you’re looking for a cleaner alternative to traditional pomades.